Recently I shared Simone France with you in my “Handwich” review and giveaway. Now I want to share another product with you and give you more information on Simone France. Simone moved to New York in the ‘60’s where she still lives today. Over the years she built a cult-like following while giving facials to Cindy Crawford, Linda Evangelista, Iman, Kirsty Hume, Amber Valetta, Vendela, Julie Kent, Verushka, Elle MacPherson and thousands of women who came to her for advice and treatment. Famed hairstylists and makeup artists such as Laura Mercier, Francois Nars, Sue Devitt and Rex, also on Simone France’s client roster, regularly recommend her. While many celebrities are paid to endorse product lines, Simone’s famous customers have never been paid spokespeople. 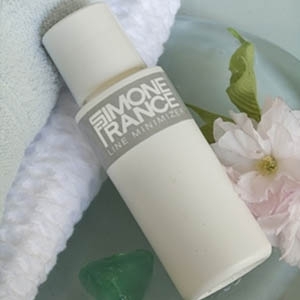 Simone France has been their private, personal choice for their own skin care. Over the years, Simone has seen “miracle treatments” come and go. But skin is still skin and that has not changed. Her classic French skin care regimen is as simple and as effective as ever. Today I want to introduce you to Simone France Line Minimizer. While it sounds like a simple under eye product I assure you it isn’t. While it can be used effectively under the eyes it can also be used on dry skin all over the face and body, it’s also fantastic on infants if they have redness or irritation, and MEN! Need I say more?